This week (Thursday), another full moon will rise as the sun sets. And, since the nights are getting dark so early now, the moon will rise pretty high in the sky before the typical person goes to sleep. So, this month is an ideal time (as is any winter month), to explore the moon illusion. The moon illusion is quite simple to notice. When the moon is rising, it looks really big. When the moon is high in the sky, it looks smaller. But if you use some measurement technique (say, comparing the moon to the size of your thumb held at arm's length), you'll find that the moon is really the same size at both places! This also means that the moon illusion is not due to the atmosphere, but to something in our heads. The reason for the moon illusion is controversial; several theories are discussed in the Wikipedia article on the subject. And, every so often, I hear of a new hypothesis explaining the moon illusion. To some degree, all of the ideas make sense, but I am not a psychiatrist or medical expert, and so I don't have the expertise I would need to weigh in with a learned opinion. But, since our distant ancestors rarely had to worry about trouble coming from the skies (a lion is far more dangerous to us than a hawk or an eagle), it makes sense to me that our brains cannot properly interpret sizes of objects in the sky. A few days ago, Nobel-prize winning biologist James Watson made some pretty racist comments (which he has since tried to retract). Watson is one of the co-discoverers of the structure of DNA, and deserves the accolades he's received for that achievement. But his remarks are inexcusable and non-scientific. Like any human, we scientists are full of our own biases and opinions. When we are working on our science, we must set those biases aside (as much as is possible), but I've never met any scientists who have been able to rid themselves of biases and opinions. It's part of being human, and it's also a driving force behind the advancement of science. If we didn't hold opinions, fight for them, and feel driven to search for evidence supporting our ideas (or against someone else's ideas), then science would go nowhere. Often, too, as scientists succeed and become secure in our jobs, we tend to explore a little more of the fringes of science. I've seen physicists exploring ESP, an astronomer who thinks he's discovered evidence of extraterrestrial civilizations, and other such things. I think it is okay to explores such issues if one feels like they can shed new light on a topic, but typically the evidence is no stronger than supposition and tying together facts that don't really mesh. As one friend once said to me, "There's a little bit of crackpot in each of us." None of this excuses Watson's remarks, and hopefully outbursts like his can show that racism continues to linger in places where many would claim it has been abolished. However, it is important to stress that his remarks are those of Watson, the human, not Watson, the Nobel-winning scientist. Friday, October 19th, at 7pm Central Daylight Time, there will be a webcast titled "Exploding Stars in an Accelerating Universe." This webcast will be given by Craig Wheeler, a professor of astronomy here at the University of Texas. Professor Wheeler is also the current president of the American Astronomical Society, the largest organization of professional astronomers in the United States. To view the webcast, you need to download a special plugin for your browser. Details on how to view the webcast and about the topic can be found here. This week, while our big symposium was underway here at Texas, the Hubble Space Telescope was also working on my behalf. This week, over a period of 7 days, Hubble is collecting the data for my approved project. It's about halfway done, and everything seems to be working so far! Although, to be honest, I haven't seen any of the data yet. Getting pictures from orbiting telescopes is much different from getting pictures here on Earth. On the ground, we astronomers go to a mountain, operate the telescope, put our images on computer disks, and then take them back home. But space is different. Of course, we can't go to the telescope and control its every move (that would be fun, but rather expensive). But there are other constraints, too. Hubble is not in constant contact with the ground -- we can only get its data when it passes over ground-based radio antennas. As I type this, Hubble is over the South Pacific, east-southeast of Kiribati, so there aren't many radio antennas there. Also, Hubble is constrained to keep within a certain angle of the sun in order to get solar power, so there are only certain times when my object is visible. In between those times, Hubble wanders to other parts of the sky to work on other projects. And, because Hubble has an old computer, all the observations must be planned weeks in advance. Even if I were to have my laptop attached to the radio antenna receiving Hubble data, I would not be able to make changes if there were problems with the data. So, I have to be patient. My data will be downloaded as time permits, checked for egregious errors, processed through basic steps, and then sent to me. Only then, probably some time in the next week or two, will I know how good or bad my pictures are! The last two days saw the third Frank Bash Symposium at the University of Texas, titled "New Horizons in Astronomy." The symposium is unique in astronomy, in that it is organized by, for, and features postdoctoral researchers (astronomers who, like myself, have completed their doctorate degrees but have not yet obtained a permanent professorship). 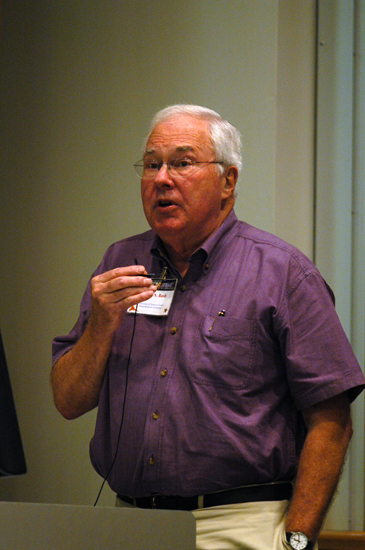 It honors retired astronomer Frank Bash (pictured above), who was director of McDonald Observatory for 14 years, and who has always encouraged young people in science, whether undergraduates, graduate students, or postdocs. I was one of the organizers of this year's event. I was co-chair of the Scientific Organizing Committee, the committee responsible for selecting the 13 speakers and responsible for getting people to attend the conference. My co-chair, Justyn Maund, probably did 3/4 of the work in this regard, but there was more than enough work to do! I also helped with the Local Organizing Committee, the group that takes care of logistics like finding a room, making sure there is coffee for 100 astronomers, finding accommodations for our speakers, and so on. The chair of that committee, Stuart Barnes, and our primary administrative assistant, Monica Kidd, did a phenomenal job in that regard. Everything went quite smoothly! But I think we are all exhausted after three full days of final preparations and execution of the event. So, fresh of this experience, I now need to plunge into organizing another conference that will be here in Austin in January. This time I'll be the local organizer, as I'm the only local person in the group. I've been blogging a lot recently about how wonderfully simple science is -- you come up with an idea, make predictions based on the idea, if the predictions hold true, then your new theory lives to fight another day; if the prediction fails, you discard the theory. But this is a greatly simplified view. If a theory fails, we don't always toss it out, because even wrong theories can be mostly correct, and with a little re-tooling, the theory can be saved. Imagine, for example, that a friend tells you she can identify any type of car based solely on the engine noise, long before she can see the car. So, you go to a spot where you can here cars before seeing them and you test her abilities. She gets the first ten cars right, but for the eleventh car she predicts a Chevy Tahoe truck, and then a Ford F-150 comes into sight. Is your friend's theory that she can predict the cars wrong? Obviously not completely, because she is 10 for 11, much better than chance. Maybe the Ford needed a new engine, and the owner stuck a Chevy engine in. Maybe those two particular engines are just a little too similar to tell apart. Or, maybe your friend is a very lucky guesser. In science, there are theories that we know are not the full story. For example, Isaac Newton's Law of Gravitation are a theory of gravity. We use these laws to send space probes to the far corners of the Solar System. You can use Newtonian gravity to predict precisely where the planets will appear in the sky ten thousand years from now. Except for one pesky problem -- the planet Mercury doesn't follow Newtonian gravity exactly. It's very, very close, but not quite right. Does this mean that Newton was all wet, and his theory is complete hogwash? NO! Newton's Law of Gravity is not completely wrong, but it is incomplete. It took Einstein to realize how Newtonian gravity was incomplete, do to a complex relationship between space, time, and mass. Einstein's Theory of General Relativity makes the necessary corrections, and it has worked in every situation it's ever tested! But if you take Einstein's General Relativity and look hard at the equations for the Moon going around the Earth, they look almost exactly like Newton's gravitational equations. They have to, because Newton's gravity works for the moon! More yet, we know that Einstein's General Relativity and another major physics theory, quantum mechanics, cannot both be true. One, or both, must be incomplete. This doesn't mean that relativity and quantum mechanics are hogwash -- GPS satellites use relativity to determine your position, and many parts of the satellites' electronics use quantum mechanics to do those relativity calculations. For what we ask the theories to do, they are good enough, though of course we are looking for the full answers. Today, the Nobel Peace Prize was awarded to Al Gore and to the United Nations' Intergovernmental Panel on Climate Change (IPCC) for their work in alerting the public to the imminent dangers of global warming. Al Gore has worked tirelessly to spread the message; the IPCC is a body trying to put together all the pieces of the science. A number of vocal people are claiming, though, that global warming does not exist. I've already blogged about how, among scientists, the reality of global warming is not debated, though, amazingly, some non-scientists still claim there is a debate. It is true, though, that the climate theories differ on the predictions of exactly what will happen, though all of these theories predict global warming will continue and accelerate. Obviously, these theories are incomplete. But, just because of that, it would be wrong to completely throw climate theory out the window! We joke about how the weathermen never can predict the weather, but they are right quite often (Click here to see how accurate your weatherman has been -- all of the cities I've tried are above 70%). So, like Newton's Law of gravity useful for a lot of things, we clearly know something about weather and the climate and can make good use of that knowledge. The new type of device being tested, called a "millimeter wave" machine, doesn't use radiation, Golden said Wednesday during a demonstration for reporters at the agency's headquarters in Arlington, Va. Instead, it uses electromagnetic waves to create an image based on energy reflected from the body. The problem is with the word "radiation." When most people hear that word, they think of nuclear bombs, horrible illness, deformities, and other awful things. But, to a scientist, radiation is much, much more. There are two main types of radiation that most of us experience: particle radiation and electromagnetic radiation. Particle radiation deals with subatomic particles, including protons, electrons, alpha particles (two protons and two neutrons joined together), muons (another subatomic particle), and many other such things. We are constantly being bombarded with most of these, and most are not dangerous in small amounts. Muons from cosmic rays are constantly passing through us; there is nothing we can do to stop these particles, but luckily most do no damage. Alpha particles come from certain types of radioactive decay; our skin easily stops those, and it takes a really high dosage to do harm a person. Electrons can come from radioactive decay, but electron radiation is also used in cathode ray tubes (the heart of a lot of TV sets and computer monitors). Electron radiation can do damage, but, again, you need to be close to the source to be in trouble. Electromagnetic radiation is also a part of everyday life. We often call it "light." This radiation includes radio waves, microwaves, infrared light, visible light, ultraviolet light, X-rays, and gamma rays. The list above is in terms of energy, from the weakest to the strongest. The dangerous radiation is all high energy -- gamma rays, X-rays, and ultraviolet light. These are energetic enough to damage our cells and our DNA, and so are best avoided. But small doses are okay (like a diagnostic X-ray), and even necessary (UV light is needed by your body to produce some vitamins). On the other hand, radio waves and microwaves are very weak. So how does your home microwave cook food? The microwaves in there are tuned to specific frequencies (like tuning your radio), and at those frequencies water absorbs microwaves and turns them into heat. So, if you keep pumping those microwaves in to some water, the water will warm up. But if the microwaves aren't at the right frequencies, they'll just pass right through you without doing anything. The point is that radiation is not inherently bad. Radiation is just a physical process. The bad radiation is energetic radiation (X-rays, gamma rays, ultraviolet light, and certain types of particles). So, the next time you hear that something is emitting radiation, don't instantly get worried. Stop and think, is this harmful radiation? And, if not, you can breathe easier. Today, the Nobel Prize in Chemistry went to Gerhard Ertl of Germany, who provided insight in to understanding how chemical reactions take place on surfaces. I am not a chemist, nor do I study materials science, so I cannot say much about Ertl's work that was not stated in the various online news stories about the award. Today is the first day of talks here at the University of Texas by John Mather, last year's winner of the Nobel Prize in Physics. Dr. Mather will be speaking on topics other than his Nobel-winning work, but I'm going to talk a bit about the science that resulted in the Nobel because (a) I almost understand it, and (b) it is an ideal illustration of the way science should work. The whole story begins with the Big Bang. The Big Bang theory was proposed back in the 1930s to explain the observation that all galaxies in the Universe appear to be moving away from one another. If you run the clock backward far enough, all of those galaxies should have started in the same spot. So, a giant explosion of some sort about 14 billion years ago might explain why all the galaxies appear to be moving away from one another. This is a nice idea, but to become an accepted theory, an idea has to make testable predictions that pan out. In the late 1940s, the Big Bang theory was developed further, and it made two major predictions. One, it predicted that the universe should be about 75% hydrogen and 25% helium. Two, it predicted that the universe should be glowing in microwaves, and "echo" of the Big Bang still visible today. Both predictions were found to be true! This is why the Big Bang theory is widely held to be correct. Not only did it explain what we already knew, but it made testable predictions that proved true. Yet another prediction was then made. In order for galaxies, stars, and people to form in only 14 billion years, the Universe had to be slightly lumpy after the Big Bang. Not too lumpy, or everything would collapse into a black hole, and not too smooth, or gravity would not have had time to pull things together. Therefore, predictions were made that the echo of the Big Bang, called the "cosmic microwave background," should show lumpiness at a very small, but detectable level. This level would be one part in one hundred thousand. Such a measurement is hard, but quite possibe -- like trying to determine how many people live in New York City and not be off by more than 75 people, and then repeating the same measurement for forty thousand other cities, all within three years. So, anyway, the lumpiness was predicted, but had not been seen. John Mather was lead scientist on the project that built a satellite, the COsmic Background Explorer (COBE) to measure the lumpiness. And, they detected the lumpiness, at just the right level that theories predicted! This was an amazing feat, and also another amazing confirmation of the Big Bang theory. Since that time, the WMAP satellite has made even more precise measurements of this lumpiness that have confirmed even more aspects of the theory. Lots of people (though only a few professional astronomers, who can be counted on the fingers of two hands) claim not to believe in the Big Bang theory. Yet when push comes to shove, the Big Bang theory has made several testable predictions that have been proven true. No other theory can claim that. It is also true that the Big Bang theory is not the whole story -- it cannot explain some details in what we observe. Expanded versions of the Big Bang theory (using things such as "cosmic inflation" and dark energy) do seem to be able to explain these details, but these ideas are still in development and being tested. I think they will be right to some degree, but time will tell. Yet all of these expanded theories include the Big Bang, because the Big Bang theory works. No other theory does. It's a point I bring up on here many times, because it is crucial to understanding why scientists believe certain theories. An idea is suggested to explain observations. The idea makes predictions. If the predictions are right, the idea will become an accepted theory. If the predictions fail, the idea has to be changed or discarded. And, in the case of the Big Bang theory, it has predicted several things that have since been discovered. And each of those is worthy of a Nobel Prize. Wait, let me find it. It's somewhere on my computer. No, not on the desktop. Hmm, not under My Documents, either. I hope I didn't put it on my data disk; I've got 1000 Gigabytes of data there, and just about anything could be there. Ah, here we go. This year's Nobel Prize in Physics went to Albert Fert of France and Peter Gruenberg of Germany, who discovered "giant magnetoresistance," or the ability of a tiny change in magnetic field to lead to a big change in electrical resistance in a substance. It may sound esoteric, but this is the effect that has allowed your computer hard drives to become big and cheap over the past ten years. I am quite happy that the Nobel Prize went to celebrate this effect. Alfred Nobel set up his prizes in part to give an award to those whose science helps humanity. And while 30-gigabyte iPods may not be a huge boon to humanity, the availability of cheap data storage does help society -- by hooking such hard drives up to the internet, large quantities of data can be stored and shared. And if you are travelling on a different continent and need medical attention, the ability of a doctor to access your home medical records may be life-saving, yet your records wouldn't be available if data storage on computers weren't cheaper and more reliable than paper files. Advanced medical equipment like digital X-rays and 3-D MRI machines require huge amounts of data storage space, but lead to ever-improving diagnoses. Likewise, a scientist can travel through the jungle or desert, taking huge quantities of data on the current state of the environment for further analysis back home. Robotic spacecraft can now take millions more pictures than before because there is room to store the data. And on, and on, and on. So, congratulations to Fert and Gruenberg! We've all benefited from their work. I finally finished my telescope proposals last night (a good thing, as they were due at 8am this morning). Hurray! This week is the week that the Nobel Prizes are awarded. Today the Nobel Prize in Medicine was announced, and tomorrow will be the Nobel Prize in Physics. In an oddity of timing, this week last year's winner of the Nobel Prize in Physics, John Mather, is visiting the University of Texas and our astronomy department as the twelfth recipient of the Antoinette de Vaucouleurs Memorial Medal. de Voucouleurs spent a lifetime studying the properties of galaxies, and the memorial medal honors an astronomer whose life exhibits such dedication to the science. Also timed to match the awarding of the Nobel Prizes was last week's awarding of the Ig Nobel Prizes, given annually at Harvard by the Annuals of Improbable Research, a magazine dedicated to describing research that either cannot or should not be reproduced. It is (generally) all in good fun, as you might guess when you look at this year's list of winners. This year's awards studied how Viagra helps hamsters overcome jet lag, how bed sheets fold, and the health effects of swallowing swords. The Ig Nobel Prizes aren't necessarily meant to highlight stupid research; many of the studies are quite serious. But the people publishing the studies usually realize that their work sounds quite humorous when viewed from outside the field, and they often see the humor in it themselves. And, sometimes, you are working on a projects and a fun little sidelight pops up (such as the astronomers who determined that the overall color of the universe is "cosmic latte"). On occasion, barbs are flung at people doing stupid things, but, generally, the Ig Nobels are just a rollickingly good time (at least for fairly nerdy people). 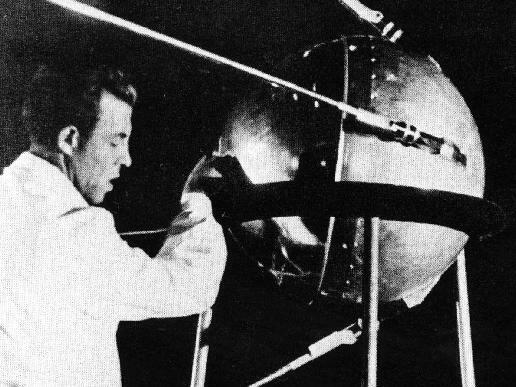 Fifty years ago this Thursday (October 4, 1957), the Space Age began when the Soviet Union launched a basketball-sized metal sphere called Sputnik into space. This first ever artificial moon showed that humankind (and, more importantly at the time, the Soviets) possed the technological prowess to explore beyond the tenuous atmosphere of our own planet. Much larger than its technical impact was its psychological and political impact. In less than 12 years, the United States landed the first humans on the moon. Although I wasn't alive at the time, the Space Race is all the more amazing when I think about what little has changed on Earth in the last 12 years. Although it wasn't huge, the Internet was in use; I already had a website and routinely used email. We are still flying the same space shuttles (although the Russian Soyuz capsules are virtually unchanged for decades -- they are quite reliable). Still, unlike many, I am not dismayed at the seemingly slow progress of human achievement in space. Robots have explored almost every nook and cranny of the solar system, humans have had a quasi-permanent presence in space, and, perhaps most importantly, satellite technology has transformed human life. Try to imaging life without weather satellites, satellite communications, or GPS systems. Satellite technology is responsible for live video feeds from around the world, and satellite TV and radio are quite popular. It took humans centuries to master sailing, and at times technology seemed very slow to advance. But, these days we can cruise over (or under) the ocean for months on end with no worries about storms, food, fuel, disease, sea monsters, etc. I think that, in time, humans will learn how to navigate the cosmos (at least our own niche of it). But it may take centuries -- not just the 12 years between the first satellite and the first moon landing. We'll get there.